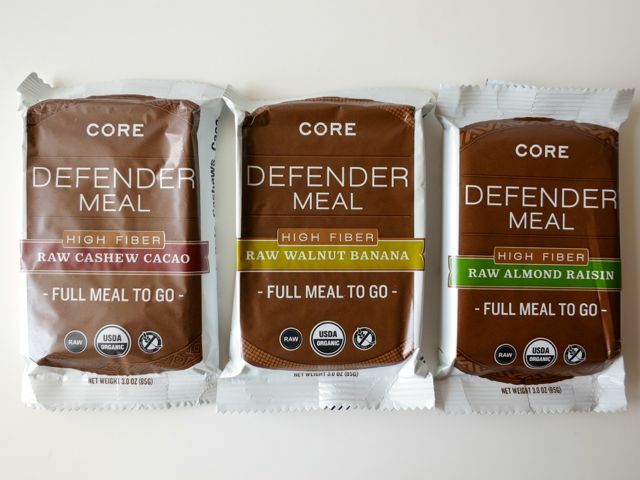 CORE Foods Defender Meals are yet another meal replacement bar that claims to be a "full meal to go." And I would agree. These nutrient-rich bars make a great breakfast bar for those on the go. 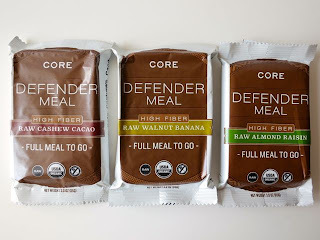 All of the CORE Defender Meals are vegan while the Warrior Meals are not, so be careful which one you buy. 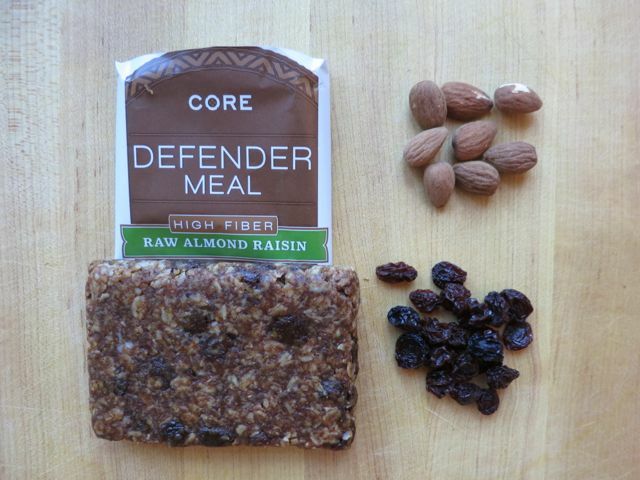 What I liked most about these bars are their purity--only 5 or 6 ingredients per bar, no sweeteners, and all organic. What I didn't like about these bars were the amount of spices they contained as they often literally choked me up and left a lasting throat-constricting feeling in the back of my throat as well as an odd aftertaste. It was all very odd. The only one that didn't do this was the Raw Walnut Banana. It was super dense and packed with goodness--whole oats, walnuts, bananas, raisins, flax, and ground spices and had a great flavor to it. 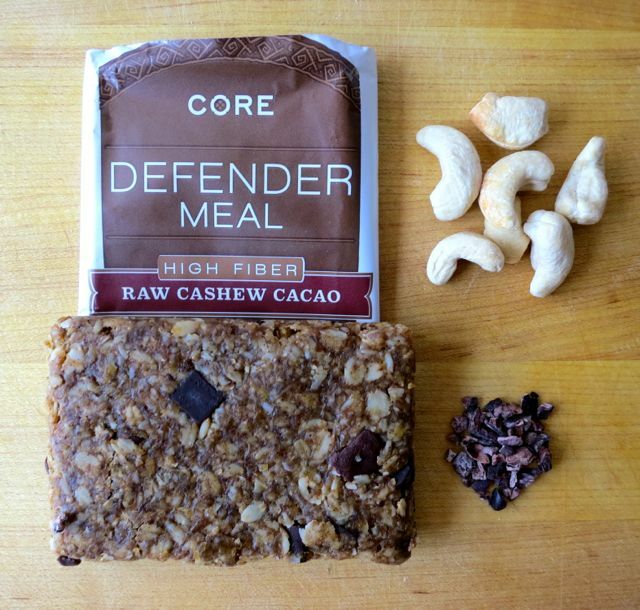 Another flavor is the Raw Cashew Cacao made with cashews, cacao, raisins, flax, oats, and ground spices. I loved that there were big cacao chips and raisins, but this was one that left me with a weird feeling in my throat. Lastly, the Raw Almond Raisin is loaded with, you guessed it, almonds and raisins. Again, the choking, dry feeling, but a nice flavor in the bar. Since they don't use preservatives, these bars do not last long. You can take them on a week-long hiking trip or store them in the refrigerator for a month, but that's about it. Alternatively, you can freeze them for up to six months. If you leave them out longer than a week, they will mold quickly. The other thing you should know is that they are high in calories and fat. 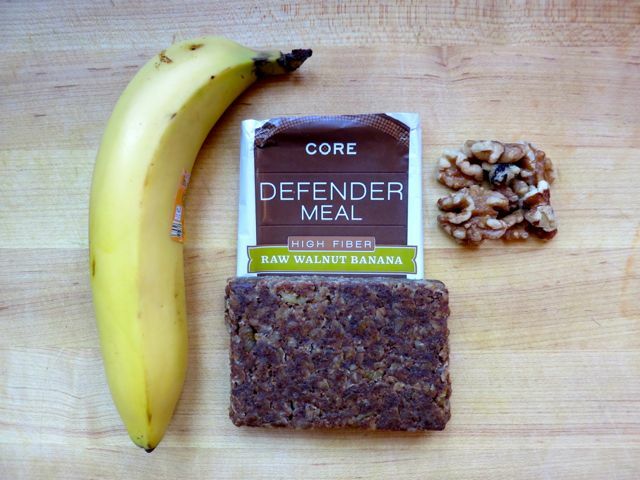 For example, the walnut banana flavor is 400 calories and 24 grams of fat. It is all good fat, but it is fat just the same. So, all in all, I like the concept a lot. I just think they need to go lighter on the spices and then they'd be perfect. They are mostly sold on the west coast, but their distribution is growing quickly. If you can't find them locally, you can order them direct here. I have to say that the Raw Cashew Cacao left one of the worst tastes in my mouth. I can't say I'll be eating these again despite the great ingredients.